Day 174: Liquid nitrogen ice cream! 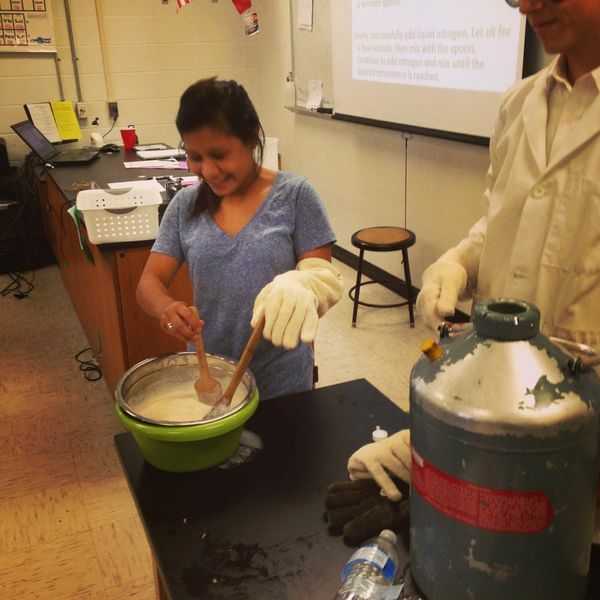 Students in chemistry had some fun (after their quiz) with liquid nitrogen. But first, Mr. Cater made sure to go over all the safety precautions and showed a video of what can happen if you aren't careful with this extremely cold liquid. Next Mr. Cater froze a few objects by dipping them in the liquid nitrogen for a short time. An apple, a gummy bear, and some flowers all succumbed to the freeze and were easily shattered. And then the liquid nitrogen ice cream (link with directions) was made. If you've never had the chance to enjoy such a treat, I hope you find your way into a chemistry class soon! The liquid nitrogen helps produce some of the smoothest ice cream you've ever had, and it's really neat to see how you can make ice cream in minutes with just a few ingredients!